This is the second box I ordered during Memebox’s December restock – the Thumbs Up! 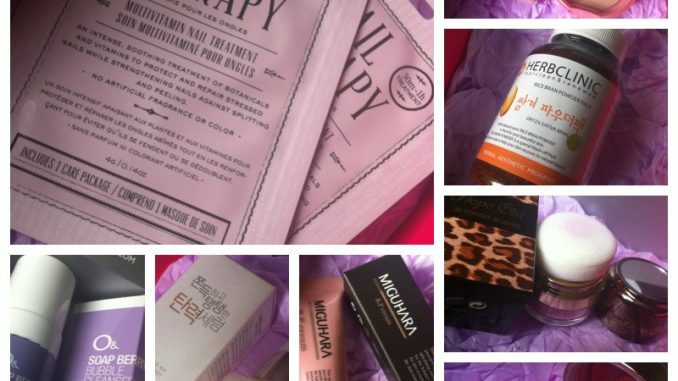 Beauty Box. 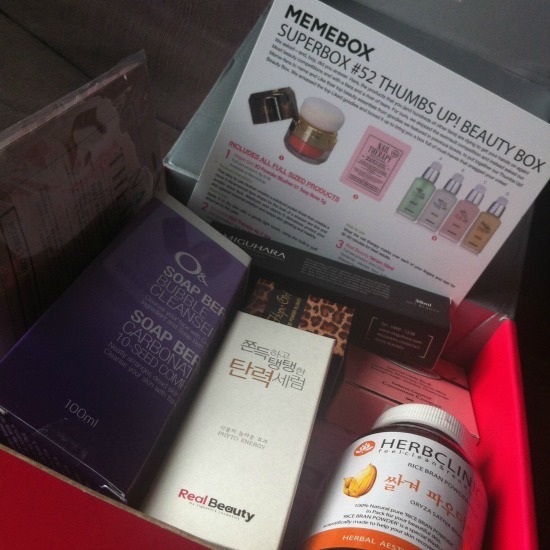 The idea behind this box is that it contains repeat products from previous Korean beauty boxes which were given the thumbs up by Memebox’s Facebook fans. It’s a neat idea for a box, though I imagine it’s quite hard to curate, Facebook not being most people’s first stop for wisdom and sanity. 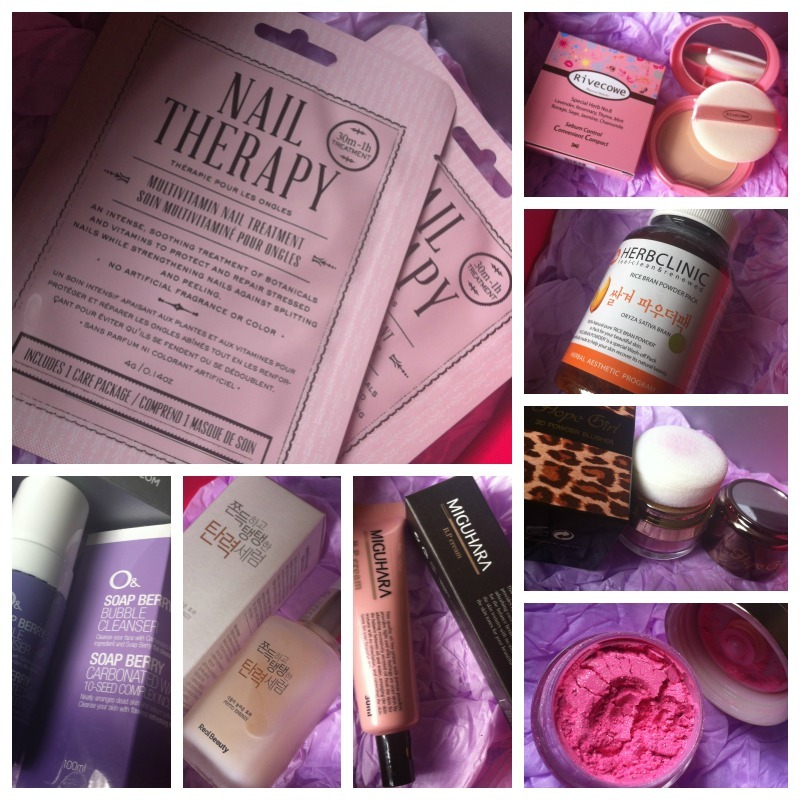 Memebox Superbox #52 Thumbs Up! Beauty Box was on sale at $32 (£21) plus shipping. It contains 7 full sized items with a combined value of $124 (£82). I’m not going to be using this. It’s bright pink and full of sparkles, and since I’m not a mermaid on crack it’s of no use to me. Quite nice packaging though – animal print, a pouffy bit for application and a tiny mirror. It’s gone to live in the Teenage Bedroom of Doom, where I’m sure it will be very happy. I first encountered these nail masks in one of Meme’s best ever boxes, the original Hair & Body, and they really sorted my nails out last winter. They’re little serum-filled hats for your nails. Wear for half an hour and you’ll have talons of steel, or at least slightly less dry nails. Once again we ponder the mystery of what Bulgarian roses are doing in a Korean beauty product. Is there a secret underground tunnel from the rose bushes of Bulgaria to the skincare labs of Korea? A mattifying powder compact in a very boring pink case. Kind of dull but useful. This creamy foam cleanser is a genuine fan fave and also educational because did you know that a soap berry was an actual thing? I wonder if using this counts as one of your five a day? AKA the whole reason why I bought the box. This wonder-primer first showed up as tiny samples in various boxes including Luckybox 3. It’s a combined BB cream and primer that smoothes the face like nothing else for that real life just-photoshopped look. Highly sought after, hard to get hold of and pricey; this is so precious I almost can’t bring myself to use it. Which kind of defeats the purpose of buying the box. I originally got this in the Whole Grain box and was a bit stumped with what to do with it. The instructions urge you to mix it with milk and honey and oatmeal to make a face mask that will briefly make you look like Shrek before falling off your face in evil breakfast-smelling lumps. It works much better if you simply mix it with water and use it as a gentle, natural exfoliator. Still smells like evil breakfast though. So although I bought this for the Miguhara BP cream, I’m happy with most of the other stuff too. I don’t trust Meme at all when they bring out boxes that claim to be ‘the best’ because they usually aren’t, but this time I think they did pretty well.